Shell and devein shrimp. Do not drain tomatoes. Cut okra in 2 inch pieces. In large saucepot, heat oil; add flour and cook over low heat, stirring softly until roux turns dark brown in color and develops a nutty aroma. Add onion, celery, green peppers and garlic and cook until cook until vegetables are tender. Slowly add chicken broth, a little at a time, stirring after each addition; bring to a boil. 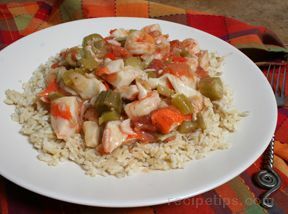 Brown chicken pieces separately until golden in color and add to saucepot with tomatoes, bay leaf, and Tabasco sauce. Simmer, uncovered 45 minutes. Add shrimp and okra; cook 10 minutes longer. 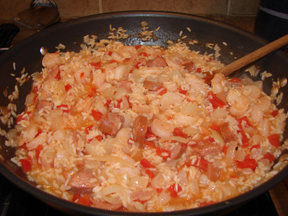 Serve with rice and additional Tabasco sauce if desired. Yield 6-8 servings. Roux: The mixture of fat and flour is a traditional basis for much Louisiana cooking. When cooked for a short period of time, it remains white, but the more it cooks, the darker it becomes. This additional cooking time not only results in nutty flavor, but also adds color to the dish being prepared.